After another intriguing round of A-League football, a number of familiar faces and a few debutantes make an appearance in the A-League team of the week. Here are the men that made the difference in Round 13. The Roar without Jamie Young is a scary thought. Once again, the reigning A-League goalkeeper of the year kept a ponderous Roar in the contest, to the point where a point in the dying minutes was still a possibility. Young is making as many saves as any shot-stopper in the league on a weekly basis, yet still the Roar have conceded 26 times. Without him, that number would be far greater. Putting aside the final result, Millar produced another outstanding display on the road against the Phoenix. It is nice to see the broader football media starting to pick up on the journeyman’s form after he found his way back into an A-League squad. I called him quite early this season; as a shining light for the Mariners, one can only imagine what he would be producing if playing down the right flank in a winning team. His involvement was impressive in Wellington and Millar can hold his head high after each and every performance in spite of the shocking run being experienced by the Mariners. I’m not exactly sure what Jacob Tratt has been doing differently since his return from the Wellington Phoenix a few years back. Frankly, the boy from Dubbo looks an entirely different player. Once again, his heading prowess was on display against Adelaide United at Jubilee Stadium. His forward runs and presence in the box made him one of the most dangerous options for the Sky Blues. His size and speed also add a different dimension to the attacking line. Defensively, he is solid and with Alex Wilkinson beside him, is learning from the best and should only improve. Much has been made of the Jets’ problems in front of goal and the inaccuracy of their attacking unit. On Saturday night they did manage to create chances and despite finding a scrappy equaliser from the boot of Kaine Sheppard, much of their build-up was handled well by the Victory back four. Broxham was at the heart of that defence and has been is brilliant form of late; calm, decisive and desperate in defence. It was another top quality performance from the veteran. As poor as the Brisbane Roar were in attack on Friday night at AAMI Park, they stood little chance against the stoic defendingInf Schenkeveld. If fact, all teams would have. The presence the German commands in the back third is not only intimidating, it is inspirational for what is now the best defence in the A-League. The luxury Warren Joyce has in moving a key defender such as Ritchie De Laet forward only occurs on the back of Schenkeveld’s organisation of the back four. After having missed a considerable amount of football, it is great to see the Dutchman back in action for the Mariners and it is no coincidence that their best half of football for the season came off the back of his impressive midfield control and distribution. 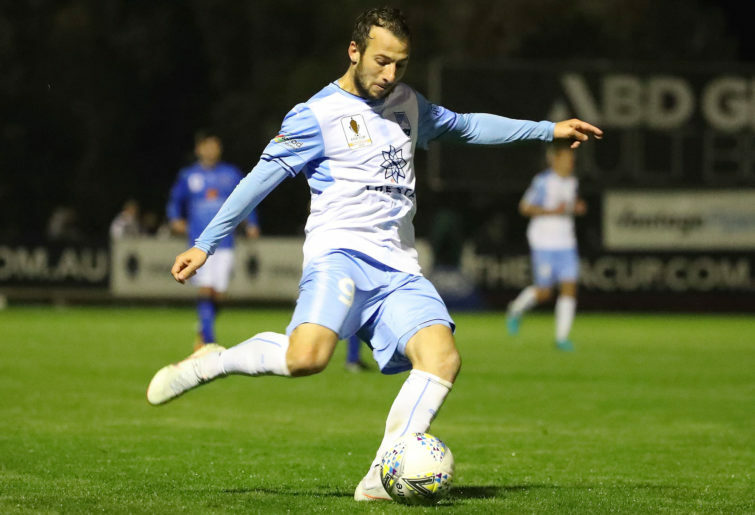 Sadly, it all went pear-shaped for the men from Gosford, yet the first 45 minutes against the Phoenix suggested there could be some better results just around the corner, with Hiariej fundamental to the improvement. It hasn’t taken Mileusnic too long since returning from injury to find something near his best form. His speed on the right worried the Sydney defence for much of the afternoon and clever step-overs and runs to the by-line provided a mountain of headaches for Michael Zullo in defence. Without a definitive striker, Adelaide needs his potency on the right side of attack, as they seek to poach goals from a variety of sources. Antonis continues to quietly confirm the plaudits he has received so far this season, despite missing out on Asian Cup selection. His controlled strike put the Victory into the lead against the Jets on Saturday night and his precision and poise in midfield was as impressive as usual. Much of the attack that the Victory execute comes of controlled and patient, triangular build ups and Antonis is often at the heart of those structures. It is highly likely Antonis will play a key role for the Victory come semi-final time. In one of Western Sydney’s best performances of the season, Kamau was sensational on the right and with some more adept finishing, could have seen his work converted more frequently in the first half. As with many of the Wanderers’ players this season, we are yet to see them at their best or the form to which we are accustomed. On Sunday night, Kamau showed a few glimpses of just what he can do when given time and space in attack. Despite not finding the back of the net, le Fondre was at his brilliant best at Jubilee Stadium as a tired Sydney held on against the Reds. The Englishman has an incredible tank and never ceases running in behind in the hope of picking up a Milos Ninkovic pass or a lucky rebound. The fear he puts into opposition defences opens up opportunities elsewhere and his Sydney FC teammates fully appreciate his influence and value. It is against the basic principles of the A-League team of the week to include a player based purely on 45 minutes of football. Krishna is an exception to the rule after producing a stunning second half at the Cake Tin and shattering the hopes of the visiting Mariners. The first of his two penalties began the Central Coast implosion and the second came off the back of his quality work off the ball. David Williams’ winner also stemmed from Krishna’s involvement and there was a handful of other half chances the Fijian almost used to grab his hat-trick.